La Michele Hotel is a small and homely hotel, proud to be a family owned and run establishment. The hotel features a restaurant and a heated outdoor swimming pool. La Michele Hotel is a small and homely hotel, proud to be a family owned and run establishment. 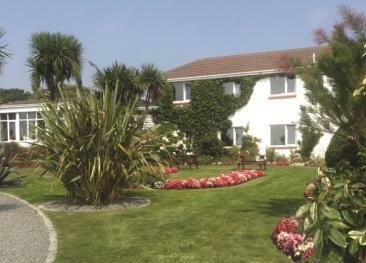 The hotel features everything required for a successful holiday: the staff are friendly and helpful, the rooms are pleasantly decorated, the restaurant serves delicious, honest food and the heated outdoor swimming pool sits in manicured gardens. All rooms are en-suite and equipped with colour television, direct dial telephone, tea & coffee facilities, and hairdryer. La Michele restaurant is open daily for a healthy full Guernsey breakfast and a three course evening meal menu. Alongside the conservatory lounge, the resident’s bar offers pleasant surroundings for a peaceful drink, a lunch time light bite and an afternoon tea. Half way between the magnificent south coast and the pleasures of St. Peter Port, La Michele is also within reach of the beautiful Fermain Bay with crystal clear seas, beach café and water sports. 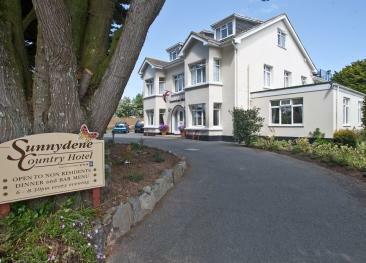 The Sunnydene Country hotel is a friendly hotel close to coastal walks, quiet country lanes and only a short drive from St. Peter Port town centre. 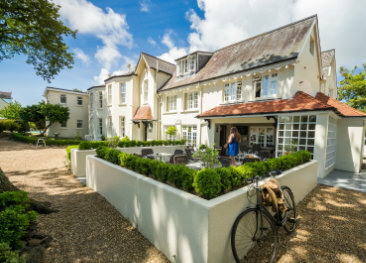 The Blue Horizon is a family-run hotel on Guernsey's south coast, enjoying spectacular sea views and direct access to the coastal cliffpaths.